From the Puslinch Pioneer, v. 15, issue 7, March 1991. Highway Six leads from Hamilton to Guelph, and if you have the time for it, you may continue north to Owen Sound. In Puslinch Township, the Guelph­-Hamilton stretch is still called the Brock Road, and there is a Puslinch tradition that connects it with Sir Isaac Brock, who died at the battle of Queenston Heights more that fifteen years before Puslinch was surveyed. The name rests on a mistake common in oral history; the Brock Road probably took its label from a surveyor who never got as far north as Puslinch, and the connection with Sir Isaac is romantic embroidery. Nineteenth century surveys called it the Aboukir Road, but I have never heard the name used. When I was a boy in Puslinch, I called it the Brock Road, and so did every­body except strangers who went by road maps, and the Brock Road it remains. I passed the road sign marking the Puslinch town line, crossed the CPR Toronto-Chicago rail line, where passenger trains once stopped at Puslinch station, and turned left off the Brock Road on to the Puslinch first concession. It was an early June day, more than two years ago. A conference at McMaster University had brought me from Vancouver to Hamilton, and after lunch I set forth on a pilgrimage in a Budget rental car. A farmer on his tractor in the field to my right raised an arm in greeting. In Vancouver, we did not wave to complete strangers. But I had been away too long; when I was a boy in a similar field, I waved to cars that passed. They were emissaries from the outside world; once upon a time, when my grandfather worked those fields, they might have stopped to chat a moment, passing on news as they let their horses rest. Now strangers hurried past in a whirl of dust, but farmers waved anyway. I reached Crieff at the first crossroads. It is a tiny place; a plain brick church with its churchyard, and a few houses. According to the Annals of Puslinch, a local history published in 1950, Crieff reached “the zenith of its historical achievement” about one hundred and twenty years ago. It had two smithies then, two stores, a hotel licensed to sell liquor, a shoemaker, a church with a manse for its minister, and sundry dwellings. There were some fifty youngsters to be educated. In 1874, Crieff built a new stone school for them, selling their old one to the Sons of Temperance who moved it close to the hotel which catered to the CPR navvies who were building the railway to Chicago. Four years later, the hotel burned down and took the Temperance Lodge with it. The church’s first minister, Rev. Andrew McLean, had died in 1873, and it was almost two years before Crieff found a replacement. By the end of the decade, the manse was empty; Crieff was sharing a minister with a larger Presbyterian congregation with a fine stone edifice called Duff’s Church on the Brock Road. The long decline of Crieff had begun. But Crieff in 1987 did not look shabby and neglected. The Rev. Andrew McLean had spent barely sixteen years at Knox Church, Crieff, before his death, but his older son was Col. John Bayne Maclean, who founded the Maclean-Hunter Publishing Company, and his younger one, Hugh, started the Hugh C. Maclean Publishing Company, which became the nucleus of Southam Business Publications. Floyd Chalmers in his biography of Col. Maclean, Gentleman of the Press, describes how the colonel returned to Crieff in 1916 to bury his mother in the churchyard alongside her husband, and was shocked at the neglect he saw. He engaged Olmsted Brothers, North America's leading landscape architects of the time, to change all that. The citizens of Crieff were grateful and overwhelmed. The manse where Col. Maclean was born was empty, and the Knox Church congregation presented it to him as a gift. Painted and remodelled, it became his country home. From then until his death in 1950, the colonel was a familiar figure in Crieff. But at the Crieff crossroads, I turned my car north to the second concession, Lot 23, rear half. The stone house had the look of neglect, and the barn was in disrepair. The back fields had become a gravel pit. The eastern boundary of the great Artemisia gravel belt runs from Caledon Township to the centre of Puslinch. The stony farms around Crieff are finding a new use. They are providing aggregate for the reinforced concrete that is changing the face of Hamilton and Toronto. “Puslinch Township”, concludes a survey done in 1982 for the Ontario Ministry of Natural Resources, “has significant possible resources of sand and gravel and should be able to meet local requirements for many years.” The future of Puslinch as a gravel pit seems assured. William Stewart took up rear half of lot 23 in 1835, and made his first payment on it in that year. I still have his receipt and memorandum of sale from the Commissioner for Crown Lands in Toronto, dated to January 9th. “Received from William Stewart the sum of seven pounds ten shillings, being the first Instalment on the rear half of Lot No. Twenty three in the First Concession in the Township of Puslinch in the Gore District, a Clergy Reserve, containing one hundred acres etc.” The remainder was due in nine further annual instalments. In fact, William failed to pay on schedule: the receipt for the second instalment is dated to 1848, the last three payments were made in a lump sum on February 27, 1855, and the crown deed, with its Great Seal, was issued on January 7th, 1856. “Victoria, by the Grace of God, etc. to all to whom these presents shall come-- greeting. Whereas William Stewart of the Township of Puslinch in the County of Wellington, yeoman, hath contracted and agreed to and with Our Commissioner for the Sale of Our Crown Lands, duly authorized by Us in this behalf, for the absolute purchase at and for the price and sum of seventy-five pounds of lawful money of Our Province etc. The farm was his at last. It was on July 12th of 1832 that the first case of cholera in Hamilton wasreported. Hamilton’s only lawyer, Allan MacNab, not yet a knight (that honour came in 1838) and not yet the laird of Dundurn Castle, which was to be restored as Hamilton’s Centennial Project in 1967, bailed out all the inmates of the debtors’ prison, and other prisoners were released, except one under death sentence. Otherwise it was certain that they would die of cholera; as it was, both the jailer and his wife did die. The pestilence had spread up the St. Lawrence and the Great Lakes with the immigrant ships: Quebec and Montreal were already stricken. A painting in the Ottawa National Gallery by Joseph Legare expresses the horror of the plague year better than words. It shows the carts taking away the dead in Quebec at night, under the uncertain light of the moon, to be buried under a layer of lime. Smudge pots burn around the city square. One body lifts an arm in supplication. It was not only the dead but the near-dead too who were taken for burial. Hamilton in 1832 was still mostly swampy land covered with coarse Indian grass and infested with the now-extinct Niagara rattlesnakes. There were no immigrant sheds in the harbour for new arrivals, but early that year, an old War of 1812 barrack was fitted out to give them temporary shelter. By midsummer, the barrack had become a pest house. It was probably there that William Stewart watched his mother sicken and die. She was buried in a common grave for cholera victims near the foot of Hamilton Mountain. Years later, William was to point out the site to his son Angus. Why had he come to Hamilton that year, accompanied only by his mother? Was he a dispossessed crofter? And what did he do in the two years that elapsed between his mother’s death and his purchase of a parcel of land from the Puslinch Clergy Reserve? He may have spent it in Hamilton: in spite of the cholera, the settlement was growing. In 1833, it was incorporated as a town. The member for Wentworth, Allan MacNab, showed his faith in the future--in his case, a heavily mortgaged one--by purchasing a property on Burlington Heights overlooking the lake, a little more than a year after William Stewart watched his mother die. There he began his new mansion, Dundurn, to the plans of local master builder and architect Robert Wetherell. It may have been MacNab himself who fathered the romantic notion that Dundurn Castle was modelled after the MacNab family seat on Loch Earne in Scotland. It fitted the persona of an ambitious member of the Family Compact, and it hinted at a close connection with the chief of the clan, The MacNab himself, who had visited Toronto a few years earlier, when Allan MacNab was young and impressionable. The MacNab had travelled in style: he came with a personal piper and a pair of bards. But the family seat on Loch Earne that provided the model for Dundurn seems to be a myth. At least, no one has ever found it. But Wetherell’s design for Dundurn has a special importance for art historians. It is the earliest example of the Italianate style in North American domestic architecture. And in the upstairs hall, someone chose to decorate the walls with Pompeian First-Style wall painting. Some ten years before, the largest dwelling in Pompeii, the House of the Faun, had been excavated, and though its wallpaintings are faded now after exposure to the weather for more than a century and a half, when found, they presented a magnificent example of what archaeologists call “First Style”: stucco painted to look like coloured marble panelling. The design of MacNab’s castle was on the cutting edge of the future. A dispossessed crofter did not move in MacNab’s circles. But it is certain that William Stewart met and came to admire the thorn in MacNab’s flesh, William Lyon MacKenzie, who resented the privileged Church and schools of the Family Compact, all of them represented by MacNab, who fitted so smoothly into the ruling class. After the rebellion of December, 1837, and MacKenzie’s defeat at Montgomery’s Tavern, MacKenzie’s lieutenant, Samuel Lount, fled westwards, through Puslinch and spent a night sheltered by William Stewart. At least, so one of William’s neighbours said later. William himself seems to have said as little as possible, and his Gaelic ­speaking neighbours were loyal. Lount was captured before he got much further, brought back to Toronto and hanged in the square before St. Jame’s Cathedral, the seat of the Family Compact’s high priest, Bishop John Strachan. There is some irony to the fact that William Stewart’s down payment on his homestead went to endow the Anglican clergy and its schools, for Puslinch was Clergy Reserve; in fact, it was the first such Reserve land in the province to be sold. The Clergy reserves were abolished in 1854, and it was the following year that William made the long-postponed final three payments on his land in a lump sum. It may not have been only shortage of ready cash that caused the delay. The land required faith or desperation, or a bit of both. The forest was hostile: an enemy to be overcome. The corpus of pioneer tales includes stories of settlers lost in it and found by friendly Indians, men walking miles through it with sacks of grain on their backs to the nearest mill to have it ground, men killed by trees falling vengefully upon the creatures who would topple them. Winter was unrelenting, when food grew monotonous and travel dangerous. One Puslinch settler, a black named Ben Bowlen, possibly an escaped slave who reached Canada by the Underground Railway, froze to death in the early 1840’s as he hauled his wheat with sleigh and oxen from his farm to Preston (now Cambridge). But it was wolves that roused the deepest and the most primeval terrors. A reader that was in use in Ontario schools early in this century related a typical fearful tale. As a pioneer boy was making his way home at nightfall with his cart and team of oxen, he heard in the distance the terrible howl of the wolf-pack. He quickly unhitched the oxen, mounted the near ox and whipped the team into a gallop. They made it to the safety of the barnyard just as the pack leader reached the oxen’s heels. For the settler, death by mishap or disease was never far away. But however frightened or homesick these Highland Scots settlers might be, for most of them there was no return possible, and they set about taming their environment. “Until about the year 1830, the Township of Puslinch was almost unbroken forest,” begins Presbyterianism in Puslinch, a little volume published in 1899 to mark Puslinch Presbyterianism’s Diamond Jubilee, for Queen Victoria had just made diamond jubilees popular. Five years after 1830, the Presbyterians petitioned the Crown Lands Department for a land grant to use for religious and educational uses. William Stewart walked to Toronto to present the petition. Clergy Reserves had been granted to support the Protestant Clergy, which the powers-that-were, not without reluctance, took to include clergy of the Church of Scotland as well as the Church of England. The Presbyterians got their land and built their church. What remains of the crown grant may still be seen where Highway 401 inter­sects Highway 6; turn north towards Guelph, and on the right is the “Crown Cemetery”, where William Stewart is buried with his wife Catherine McPherson. But except for his long walk to Toronto, William had little to do with the Presbyterian congregation that petitioned for the grant. In 1840, the Presbyterians of the West Puslinch built their own log church at Crieff, much closer to the Stewart farm, and sixteen years later, they were prosperous enough to afford a minister of their own, who expounded the faith in long Gaelic sermons, followed by a short service in English for those whose Gaelic was insecure. Donald Dhu McPherson, a widower with ten children, reached the Crieff are five years after William Stewart bought his lot. He seems to have been part of a McPherson tidal flow, for across the road from Donald Dhu lived Dune Bann McPherson, three of whose daughters married sons of Donald Dhu. But Donald's eldest daughter, Catherine, married William Stewart. She was only three years his junior, though she outlived him by fourteen years. I know her only from a faded photograph of a very old woman looking, unsmiling, out of an ornate frame. There is one other scrap of evidence, William’s account book, where he jotted down his expenses year by year, in English pounds until the end of 1859, and then in dollars and cents, passed on to his son Angus. In the 1880’s, one expenditure appears regularly at two month intervals, in Angus’ handwriting; “For mother: 1 Gal. gin, $1.50.” The draft that Catherine drank at bedtime to keep her aged heart beating during the night was not the local whisky, though in the great days of Crieff, one Duncan Cameron Lohiel had brewed a liquor known as Kilrae which was esteemed even beyond Puslinch's borders. The gallon of the gin that Catherine drank was worth a hired man’s wages for a week. And it worked. She lived to ninety-two and died only then when she started a fire by dropping a lamp and suffocated in the smoke. In 1906, the Historical Atlas Publishing Co. of Toronto published an atlas of Wellington County. It was a commercial venture; subscribers paid to have potted biographies of their families included, and consequently the Puslinch Scots were not well represented. But the paid biographies that do appear betray a quiet pride. These were success stories; the failures had disappeared. The township maps showed neat rows of lots, each with the name of an owner. Angus Stewart’s name now appeared on his father’s farm; his brother Donald had the next lot west. The townships had a surplus population. William Stewart’s two daughters emigrated to Michigan and sundry McPhersons and McNaughtons left the Crieff area for Manitoba. The church in Crieff where Andrew McLean had preached his Gaelic sermons had been replaced by a smaller brick building, and Gaelic had given way to English, although a Gaelic service continued to be held in the vestry for a few of the older generation until close to the end of the century. In the 1870’s stumping machines were introduced, which finally removed the red pine stumps which would not decay or burn, and the roots were upended along the borders of the fields to form stump fences. The first settlers had threshed their grain with a flail, and tossed it into the wind to remove the chaff: the method had not changed greatly since the days of the Roman Empire but now threshing outfits appeared, powered first by horses and then by great steam engines that devoured wood and water. But the true badge of achievement was the farm house built to replace the settler’s log cabin. Substantial, resplendent with barge board or fret work on the eaves with grounds carefully tended by the farm wife, it announced that the infrastructure of civilized society was now in place and the days of the pioneer were past. Scots liked stone houses. Stone was substantial, it lent a manorial air to a family seat, and in Puslinch, it was singularly plentiful. Yet, the ambience of success that the Historical Atlas purveys is an incomplete story. The settler who purchased his lot could only guess what sort of land he would have when he cleared the trees from it. The Pennsylvania Dutch, who were more experienced than the European immigrants, looked for land where the black walnut tree grew, for it liked good soil. The Scots settlers felt more at home with rocks. But stony soil made indifferent farms. Scattered along the concession roads of Puslinch one may still see a lilac bush grown wild, or perhaps a clump of rhubarb or hops vines, and occasionally a stone chimney, all that remains to mark a settler’s cabin. The settler failed, sold out and moved away. Why? Bad luck? A husband who drank? There was plenty of opportunity; in 1863, there were nineteen licensed taverns in Puslinch. A wife who died in childbirth? One farmer on the third concession road came upon the skeleton of a woman and child as he was digging a post hole. All that was left to identify her was her red hair. Or was the land which the settler hacked out of the forest too poor to support a family? The countryside keeps its secrets and the Historical Atlas of Wellington did not dwell on failures. But the map of the township does show a diverse group of settlers. The Highland Scots were in the southeast, though among them was a pocket of German Protestants. To the west were Pennsylvania Dutch, separated from the Scots by an English group, and in the north were the Irish, both Protestant and Catholic. There was a Danish family and another from Alsace. They came for various reasons: the Dane had been press ganged aboard ship in Copenhagen, and had managed to escape while he was in an American port. A woman from Ulster had married inappropriately, and her family had dispatched her to Canada along with her unsuitable bridegroom. But living together on the frontier rapidly rubbed off the ethnic differences, and within a few years the settlers passed the ultimate test of toleration; they were inter­marrying. The exception was the Irish, where the enmity between Protestant and Catholic went deep. Until 1880, Patrick Downey presided over the school in section three, in the heart of the Irish settlement, and even the Protestants agreed he was a great teacher. His enrollment reached as high as 104 pupils at one point. He had once studied for the priesthood, but the temptations of the flesh intervened. He married and had a family which he raised in the teacherage on the school grounds. A rumour with a Protestant source had it that he would slip across the road to the nearby tavern during the noon hour recess, but his paedagogy seemed not to suffer. There was another rumour that when the Fenians raided across the border in 1865, and a call went out for volunteers, Downey tossed his hat into the air and said he would happily wade knee-deep in Protestant blood. In 1880, the Protestants decided to have their own school. Twenty-one years later, the school inspector condemned both the Protestant and Catholic school buildings, and economics proved stronger than bigotry: both varieties of Irish joined to build a new structure which continued to be known as Downey's School as long as it was used. It had one other distinction too. It was red brick. It was the only little red school house in Puslinch. All the other sections, S.S. Nos. 1 to 12, had stone schools. William Stewart’s son Angus, born when his father was already 48, came to School Section No. 3 for his wife: a McWilliams whose family came from Ulster, and she knew not a word of Gaelic. The gobbet on the McWilliams family in the Historical Atlas concluded, “As will be seen, the McWilliams family are (sic) connected by marriage or otherwise, with some of the best families in the county.” The generation of McWilliams women who were still alive when I was a boy spoke with genteel accents that I thought were unique, until I heard the same accents at a high tea in the Beresford Arms Hotel, Armagh City, in a troubled part of northern Ireland. 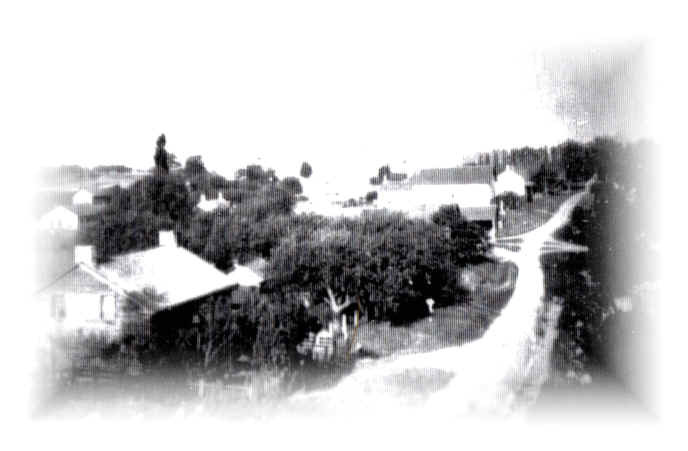 Sarah Denny McWilliams had purchased land in Puslinch at the age of 63. Her husband had succumbed upon arrival to illness or old age, and was interred in a burial plot in Guelph, where eventually a skating rink was built over his bones. Not even his prenomen is remembered, much less the reason why, at an age when most men plan retirement, he chose the life of a pioneer in Upper Canada, but one family memory has it that he had committed the ultimate social faux pas: he had lost his money. The widow’s son, Charles, carried on. He is a more tangible figure. In 1842, he returned to Ireland for a visit and kept a diary of his voyage, where he put down what he considered important. The captain of the ship, which Charles neglected to name, was a good man with a fine voice, and each day he held a church service where everyone sang hymns lustily, especially the captain. One day, a lady on board was thrown against the rail as the ship lurched through a heavy sea, and expressed herself in unladylike terms, whereupon an ordinary jack-tar rebuked her. Charles overheard and approved. When he reached Ireland, he went to morning prayer at his old church in Aughnacloy, where he noted with satisfaction that an elderly parishioner heard a new voice raised during the singing of the hymns, and remarked, “Charles McWilliams must be home from Canada!” Also, he noted that he gave some apples he had brought from Puslinch to the rector, who exclaimed that these were truly the golden apples from the Hesperides. But it seems that Charles’ trip was for business as well as pleasure. He seems to have had an eye on some livestock, and while he was viewing a particularly fine pig, his literary inspiration apparently left him. He broke off the diary and wrote no more. It was Charles’ second youngest child, Mary Ann, whom Angus married and took with him to Crieff, a long buggy ride from her home. I still have one of their wedding presents: a kerosene lamp with an enameled base, badly worn. And I have the piano that once stood in their parlour, made by the Bell Piano and Organ Company of Guelph, Ontario. But both of them died before I was born, and I know them only from faded sepia snapshots. The stone house that Angus built was solid and respectable, not large by the standards of its day, but with an air of permanence in a universe of assured values. Perhaps the pictures deceive a little. This was also a society of limited opportunity. Farmers’ sons with no farm to inherit worked as hired men, saving their wages and hoping to put a down payment on a farm, if a farm was to be had. The township was becoming a land of emigrants. Women had one proper career only: marriage. If their fathers could afford to board them in a city, they might get enough schooling to become teachers, and then would flit from one school section to another, contending with the recalcitrance of their pupils and the prejudices of the school trustees. But the final goal was still marriage. The woman who got neither a husband nor any training might stay at home, looking after the old folks, and after their death living on in a few rooms reserved for her in the farmhouse by the terms of her father’s will. She might do housekeeping, or practical nursing. Sometimes she developed “bad nerves”, an indefinable but quite respectable ailment for spinsters past forty. A radial line to Puslinch Lake was actually surveyed just north of Angus Stewart’s farm. Just about the time the Historical Atlas made its brave prediction, Angus and his youngest daughter crossed the road one summer evening to take a look at the surveyors’ stakes. As they examined this promise of a new technological marvel, they heard a great rumble in the distance, and as they watched, a motor car rushed by in a cloud of dust and stink. It was the first car either of them had seen on the concession road. The radial line to Puslinch Lake was never built, and within fifty years the motor cars had terminated the light electric railways, and the rails were being torn up. Another twenty-five years on, and we were to regret their demise, but by then, it was too late. Yet, at first, the automobile was a smelly, noisy contraption, very destructive to the hats of those venturesome ladies who rode in them. Only farmers who were prosperous and very progressive bought them. A little filler that appeared in the local newspaper celebrated the motor car’s capacity to assault the olfactory nerves. As an automobile rushed by. And one skunk watched with a mournful gaze, And a tear stood in its eye. But automobiles were the future, and they soon became common sights on the concession roads. They were stupid contraptions, utterly deaf to commands that even the baulkiest horse understood. One Puslinch farmer, who was using his bank barn as a temporary garage, drove his new automobile on to the threshing floor, shouted "Whoa! ", and emphasized the command by tramping hard on the accelerator. The car lunged forward, through the front wall of the barn and down on to the manure pile directly below. Angus Stewart was always careful to drive his Model T Ford with his arms stiff. If it developed any notions of steering itself in unauthorized directions, he was prepared to wrestle it back into obedience. But it was not only the automobile that ended the society which the settlers had built. Even more responsible was World War 1, or the “Great War” as it was known until World War II came along. Every township has a grey monument to the dead, with a long “honour roll”. Puslinch’s monument, close by the township hall at Aberfoyle on the Brock Road, shows a soldier standing quietly at attention, with his rifle by his side. Canada, a country of some 8 million in 1914, put 625,000 men into uniform and lost 61,000 dead. One hundred and forty-seven came from Puslinch and twenty-three of them died. It was not unadulterated patriotism that attracted the volunteers; in 1914, a soldier’s wages seemed not bad to an able-bodied hired man in Puslinch, and there was the promise of adventure thrown in! Still, in the one-room schools of Puslinch, George V and Queen Mary looked down on the pupils from a framed lithograph on the front wall, and since there was some reluctance to throw out pictures of dead monarchs, King Edward and Queen Alexandra might still look down from a side wall, and on the back wall there might be Victoria, leaning on one elbow and looking with heavy-­lidded eyes into the distance. The Empire still mattered and in some vague way, Puslinch felt a part of it. It needed Puslinch’s support. As the war dragged on, the enthusiasm may have become more restrained, but by then, it was bad form to say so. Yet I was told of one man who decided to volunteer in the last year of the war, for although he had not been conscripted, his brother had been, and he thought he would keep him company. A white-haired militia colonel was at the recruiting desk in the Guelph Armouries. “Have you been called up yet?” he asked. The young recruit said not yet. “Well, go home and wait till you are,” said the colonel. “I’m sick and tired of sending young men over there and having them blown to pieces.” The would-be recruit went home. A few months later, the carnage was over. At least the Great War produced unanimity among the Puslinch Presbyterians. The next trial did not. The United Church of Canada arose in the mid-­twenties from the coalescence of Methodists, Congregationalists and such Presbyterians as were willing to join. It is the only uniquely Canadian church, with roots in Canadian soil and a theology for all seasons. The Puslinch Presbyterians voted on union in early January, 1925. The vote must have had some of the qualities of the 1980 referendum in Quebec on sovereignty-association. The Centennial History of the Puslinch church notes that for the month before, over the Christmas season, “community prayer and social meetings” were held in various places, and they were “conducive of much good”. A large portion of the congregation abstained from voting. Of those that did, only some twenty percent opted for union, though among them was the minister which the Crieff church shared with Duff’s Church on the Brock Road. Crieff weathered the schism well. The year before the vote, on Thanksgiv­ing Day, there had been a special dedication service at the church; Col. John Bayne Maclean’s landscaping project was complete and people gathered to admire it. The church where his father had preached had been replaced in 1882, but his grave and that of his wife were in the church­yard, marked now by a slab of grey granite. The following year, having voted against union, the Crieff congregation gave the colonel the old manse and its half-acre lot. Was there a trace of canniness in their gift, as they looked forward to an uncertain future, with a new minister? Perhaps so. The old manse was empty and falling into decay. The colonel made it his country home, and his interest in Crieff continued until his death. In the late summer of 1989, I returned once again to Crieff. The fields were dry, and the goldenrod bloomed yellow in the fence corners. The churchyard is still well-kept by the standards of country churches, though it has declined greatly from the days of Col. Maclean. A sign outside the plain brick building announces “Rev. M. Anne Yee-Church Service, 9:45, Sunday School, 10:45.” The granite slab that marks the graves of Rev. Andrew McLean (now spelled Maclean) and his wife also mentions the deaths of their sons, Col. John Bayne, in 1950, and his younger brother, Major Hugh Cameron, the year before, though both are buried in Toronto. The manse which Maclean restored and enlarged had the flag of Denmark waving lazily in the breeze, and a sign announces: “Sunset Villa Club: Danish Association.” And on the nearby hill to the west, the Crieff school still has a marker in the gable fronting the road, declaring that this is School Section No. 6, built 1874, but it is now “Maclean Hall” and is part of the “Crieff Hills Community Conference Centre”. Facing it across the road, in front of a decaying stump fence, stood a sign announcing a new subdivision: “Grandmark Homes”. And behind “Maclean Hall”, where the rolling hills disappear into a tract of pine reforested a generation ago, another sign proclaimed the site of a new conference centre. I turned north and drove to the second concession, to the homestead where William Stewart settled in 1835. The barn and the stone house had disappeared; only the untidy remains of a cedar hedge marked where they had once been. A diminutive board nailed to a tree read “Warren Bitulithic”. I turned back, across the overpass that spanned Highway 401, and left at the old Accommodation Road. A cricket was trilling his love call by the roadside, somewhere among the dry milkweed. I had not heard a song of a cricket for years. Will there be room for crickets, and butterflies and milkweed in the new southern Ontario of superhighways and sprawling suburbia?